Ready for the next installment of Progressive Eats? I sure am! It’s time again for our group to put on its monthly virtual dinner with everything from soup to dessert. Modeled after the ever popular progressive dinner, we each choose a course based around a theme and present the complete menu on the last Tuesday of the month. This month’s theme is Weekend Ski Party and is hosted by Susan Pridmore who blogs at The Wimpy Vegetarian. As I was considering what to make for our ski party, I realized that I had never actually been skiing much less to a ski party. What in the world would I serve? Hmm. In chatting with Barb, the founder of Progressive Eats, about my dilemma, she suggested that I imagine a heavy snow in Georgia and what I would feed family and friends after a day playing in the the cold and snow. Easy, I said! Chili and chicken wings. Yeah, I’m so sophisticated. Anyway, I also thought that if the family were all outside playing, I’d want to be out there with them and not in the kitchen. And the best kitchen helper for that situation is a trusty slow cooker, right? 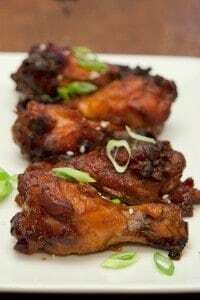 Since I already have a great Baked Buffalo Wings recipe on the blog, I thought I’d take these in a little different direction and give them an Asian flair. 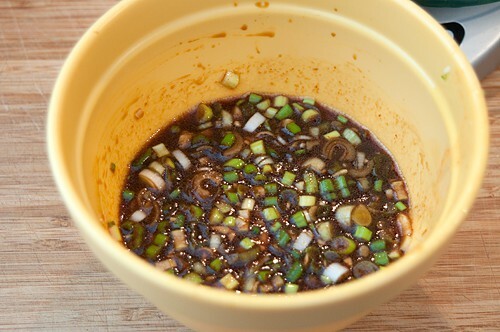 Soy sauce, honey, Sriracha, ginger…yum. All you do is broil the wings for a few minutes, mix up the sauce, and dump it all in the slow cooker. Easy, easy. The broiling of the wings, by the way, helps the skin keep a nice texture during the long, slow cooking. I think I’d enjoy these Slow Cooker Asian Style Wings at the end of a long day in the snow, wouldn’t you? Preheat the broiler on its highest setting. 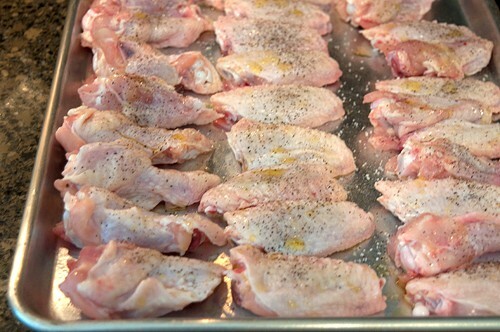 Arrange the wing pieces on a baking sheet. Drizzle liberally with olive oil and sprinkle with salt and pepper. Broil on the top oven rack for 10 minutes. Turn wings over and broil for an additional 10 minutes on the second side. While wings are broiling, prepare the sauce. In a small bowl, combine all remaining ingredients except garnish. Stir until well combined. Place the wing pieces in a slow cooker and pour over the sauce. Cook for 4-5 hours on low heat. Gently stir occasionally to distribute the sauce throughout the wings. Asian style wings made easy with the slow cooker. Preheat the broiler on its highest setting. Arrange the wing pieces on a baking sheet. Drizzle liberally with olive oil and sprinkle with salt and pepper. Broil on the top oven rack for 10 minutes. Turn wings over and broil for an additional 10 minutes on the second side. 1 1/2 times? So you have waayyy more experience than me! I am gonna sit and eat the wings and watch everyone slush down the slopes. When they come over for wings, I will say “what wings” wiping my mouth to hide the asian sauce :D The flavors in these wings are great. I won’t be inclined to share . We’ll put back an extra recipe of them in the kitchen, Ansh, just for you and me to share :-) Shhh…don’t tell the others! Thanks, Liz! They really are delicious. I’m loving the progressive dinner party menu! 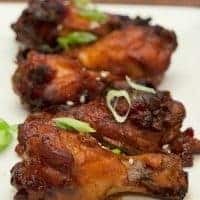 These wings look great and I love that they are made in the crockpot! Gotta love a slow cooker, right? It really frees up the cook from kitchen duty! My neighbor use to make wings similar to these for every block party. They were so amazing! I can’t wait to try these! Hope you like them, Angie. They’re great for any party occasion. Now I want to host a ski party! We have been skiing every Sunday and always crave something hearty like these wings when we get home. I’ve never been skiing, Dara, but I can imagine that you’d need something warm and comforting coming off the slopes! I’ve got to pick up some wings now! Looks ah-mazing Lana. Slow cooker wings are my favorite right now, and these sound delicious – I love these flavors! Thanks, Heather, and they couldn’t be simpler. Basically mix, dump, and cook. I so totally want to join your for a weekend ski party! ESPECIALLY IF YOU’RE MAKING THESE LITTLE BEAUTIES! Please do, Nikki! Come right on over! These are perfect for a ski weekend, especially since they can be made in the slow cooker. I think you’ve totally succeed in your quest for a snowy weekend in Georgia! Go play outside while these cook all day. Snowy weekends in Georgia are very, very rare, Susan, but when we do get one we all really enjoy it! I absolutely love chicken wings and these look amazing Lana. I love the trick of broiling them and of course anything in a slow cooker makes my life so easy ;-) These may make an appearance at this weekend’s Super Bowl party! The broiling really keeps the skin from going “flabby” in the slow cooker, Jane. And it only takes a few minutes to do. Then just dump and cook! When I get finished skiing tomorrow, I would love to come home to these!!! What a great technique of broiling them first and finishing in the slow cooker. Great idea for next weekend’s game day too! Definitely a dual purpose recipe, Susan! Ski party, football party…any occasion really. These wings are finger licking good! I’m picking up my skis and I’ll be right there. Your progressive lineup looks fantastic. Your flavors sound so good too! Asian style wings are my most favorite. Love that these are slow cooker! Weekend ski party is such a theme. Y’all are creative. :) And these wings look great! I’ve made something similar but with chicken thighs and they’re sooo good! Great idea, Erin. This sauce would be great with thighs for a weeknight dinner. Love that you made these in the slow cooker, they look fabulous! I love my crockpot! I’ve never tried making wings in there! Slow cooker chicken wings- I’m in!! These look amazing!! I love wings, but never thought to finish them in the slow cooker. Plus, that sauce!!! I have never made wings in the slow cooker before but I love the idea. It takes all the work out of game day prep. I just pinned these Lana. I can’t believe how good they look. Wait. I can believe it! You made them! 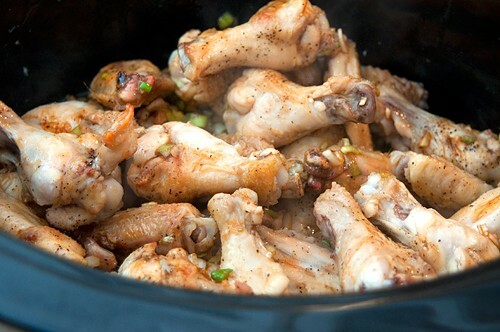 These wings look so delicious that am going to make them for Super bowl Sunday. I made these for the Super Bowl today, and they were phenomenal! Everyone loved them. I think I’ll use the sauce for drumsticks at dinner soon!